08:20 dadix hello , who knows if the radar mod is working? 08:27 sofar changes? you mean that you don't see it work? 08:28 sofar are you in creative? did the module load? see any loading messages? 08:28 sofar does /mods list it as loaded? 08:30 dadix I must to craft some things to make the radar? 08:30 dadix or it's a single block thing ? 08:32 sofar tried them yet? 12:29 dadix there is a command line or something to make my all land flat ? 12:33 XeonSquared Is there a way I can use either lua or an existing mod to let me use keys to control the camera? 13:13 dadix how to do command on the server ? 13:25 kaeza dadix, /command ? 13:27 dadix it is possible to write in that window opened by minetestserver some commans? 13:28 dadix how to clean it? 13:32 dadix how to enable this? 13:33 Obani dadix, maybe that you can rollback your world ? 13:34 dadix how to do that? 13:36 Obani dadix, If you are making an opened server, close it for some time or kick players coming with a message like "Under maintenance"
13:38 dadix I don/t know much about minetest but I have some exoerience with opensimulator. Can I remove all the construction but remain with the biome and terrain in minetest ? 14:59 thefamilygrog66 Licensing question: If I'm using an obj model licensed as CC0 1.0 for my mod, do I need to license the mod as CC0 1.0 as well, or can I use WTFPL? 15:20 thefamilygrog66 Thanks, Wayward_One. I will do that. 15:22 thefamilygrog66 CC0 1.0 and WTFPL are pretty similar from what I can tell, anyway. 15:32 est31 if you change the username does it work? 15:33 est31 so it worked before? 15:38 est31 does it print "supplied wrong password"? 15:39 est31 are there any other players on the server, or only you? 15:41 est31 can you open it in an editor? 15:44 est31 is there anything behind the colon? 15:44 est31 or is it a long piece of text? 15:55 dadix must to remove them also ? 16:06 est31 did you have worldedit on the server? 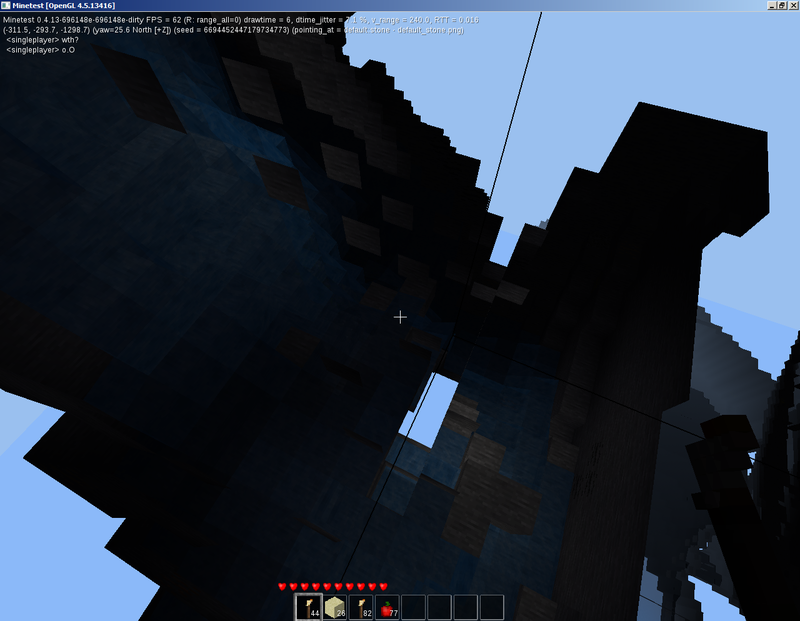 16:06 Fixer have you ever noticed strange water glow in minetest? 18:13 rubenwardy Is the username you connecting with the same as "name" in minetest.conf? 18:15 rubenwardy are you certain that they are getting minetest.conf from the same place? When you enter to the server from the gui, are you using the "server" tab or the "singleplayer" tab? 18:16 rubenwardy is there server on the same LAN network as you? I think you need to use the LAN ip if so (to avoid NAT errors) - if it's the same computer, use "127.0.0.1"
18:19 rubenwardy Are you using the same username when in server tab? 18:37 Krock tried connecting with empty pass yet? 18:41 Krock tried to delete your acc data line in auth.txt yet? 18:42 rubenwardy "Segmentation fault (core dumped)"
18:45 dadix how to create the server ? from terminal or GUI ? 18:46 dadix which way is better? 18:49 dadix do you have a tutorial about this? 18:52 Krock In the full train. I pray for god. Nothing happens. I pray for Allah. Everybody's gone. 18:53 dadix when I create the server name what to do first? 18:53 dadix the server name or first must to enter the username for me ? 23:24 Fixer core dumped? is it really dumped these days? 23:27 rubenwardy do you know where that phrase is said to come from?